BLUE DEVIL WEEK continues here at Once Upon a Geek! 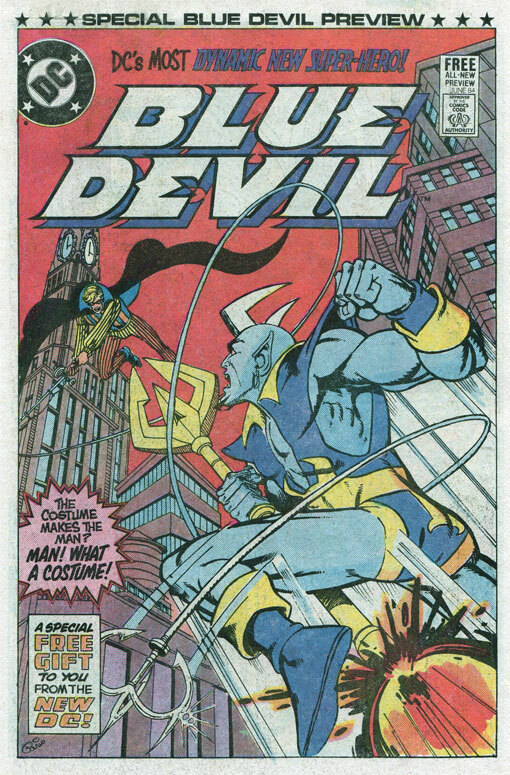 Today we’ll be spotlighting some of my favorite stories and supporting characters from Blue Devil. Don’t forget, on Friday we’ll feature an exclusive ONCE UPON A GEEK interview with the creators of Blue Devil! The earliest Blue Devil stories are without a doubt the best. I could die a happy man if DC were to collect: the Blue Devil Preview comic (published in The Fury of Firestorm #24), Blue Devil issues #1-9, and the Blue Devil Summer Fun Annual #1. These comics really form the foundation for the Blue Devil mythos and nearly all of them feature gorgeous artwork by Paris Cullins. The stories feature action, drama, and a healthy dose of humor. Here you meet Dan Cassidy and follow his transition from Hollywood stuntman to reluctant superhero. You also get to see mainstream DC Universe characters such as: Zatanna, Superman, Elongated Man, Phantom Stranger, Etrigan, Metallo, and the Trickster. 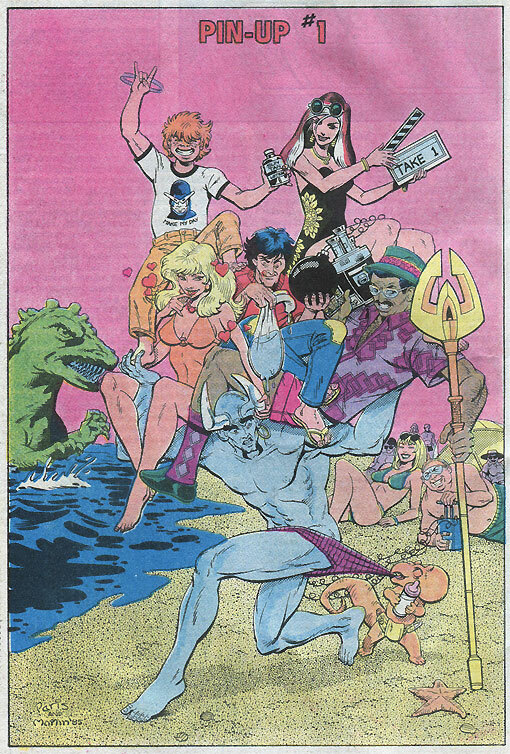 You even get some original characters in these stories, including: Shockwave, Bolt, Nebiros, and Gopher Bloomberg (who would go on to become the Teen Titan Red Devil). If you’ve never read these issues, do yourself a favor and pick them up. For less than $14, you can purchase all 11 of these comics right now from Mile High Comics (before shipping). Another great Blue Devil story is the four-issue mini-series JLA: Black Baptism (2001). In this story the JLA must stop the rampage of a mob of demons to protect the Sentinels of Magic. This series prominently features Faust and Blue Devil, and was probably the best portrayal of Dan Cassidy since the original series had been canceled. There really wasn’t much humor in this tale, but it was still a fine story. This is another one you can pick up cheap online at Mile High Comics – all four issues for about $5 (before shipping). 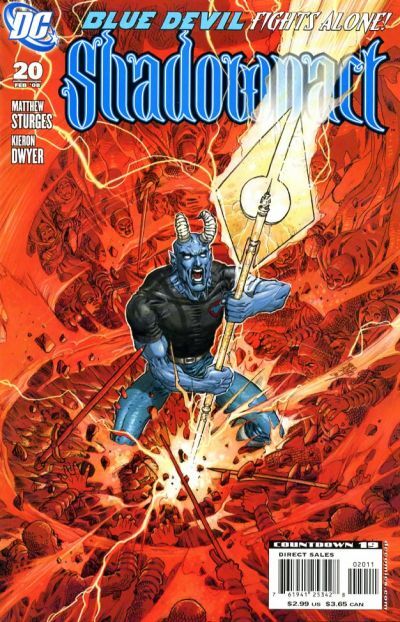 Finally, Blue Devil’s recent return to stardom in Day of Vengeance and Shadowpact is worth mentioning. Bill Willingham and Matt Sturges really fleshed out the character for the first time in nearly 20 years. Blue Devil starts out in the series as a bouncer for an interdimensional magic-users bar. You then follow his journey as he learns more about the deal he made with the demon Neron, and that it’s the man that makes the hero (not the powers). You can pick up trade paperbacks of these great issues from your local comic book shop. Be sure to look for or special order: Day of Vengeance; Shadowpact vol 1: The Pentacle Plot; Shadowpact vol 2: Cursed; Shadowpact vol 3 – Darkness and Light; and finally, Shadowpact: The Burning Age. I was planning to write up information on each of my favorite supporting characters. However, I simply don’t have the time and other folks have done it better than I could. So I’ve listed my favorite supporting characters and have provided links so you can read more about each. Nearly all of these links go to Justin’s Honest-to-Goodness Blue Devil Page. Don’t forget, on Friday be sure to catch the very first ONCE UPON A GEEK creator interview with Dan Mishkin & Gary Cohn! Paris Cullins drew some way-cute girls!